September 10, 2014 Daniel G.
Two million dollars still goes a fairly long way when buying a home in many parts of Silicon Valley, but in Hillsboro Beach, Fla., it’ll barely get you a stairway to heaven. The current most-expensive home for sale in America was recently listed with the Multiple Listing Service for an astounding $139 million. Located on four lush acres on Florida’s Millionaire Mile, the still-unfinished mansion’s central feature is a steel-iron and gold leaf sweeping staircase that cost $2 million to construct. The listing was announced in the Los Angeles Times on September 6. Architecture of the publicly listed home known as Le Palais Royal was inspired by the Palace of Versailles, once the home of French Kings. Within 60,000 square feet of living space are 11 bedrooms, 17 bathrooms, a presidential suite with a pool and terrace, three other master suites with Jacuzzis and ocean views, the first Imax home theater ever built in a private residence and an outdoor infinity-edge pool with a water slide and a swim-up bar. And of course no oceanfront home of this stature would be complete without an indoor spa and massage room, a pizza oven, a 12-foot waterfall, an expansive dock that can accommodate 185-foot vessels and 465 feet of private beach. The price tag of Le Palais Royal just edged out that of the Beverly House, a former home of publishing magnate William Randolph Hearst, which showed up on the market earlier this year at $135 million. However, neither home rivals the privately listed Hombly Hills estate known as The Manor, which was once owned by Candy and Aaron Spelling. 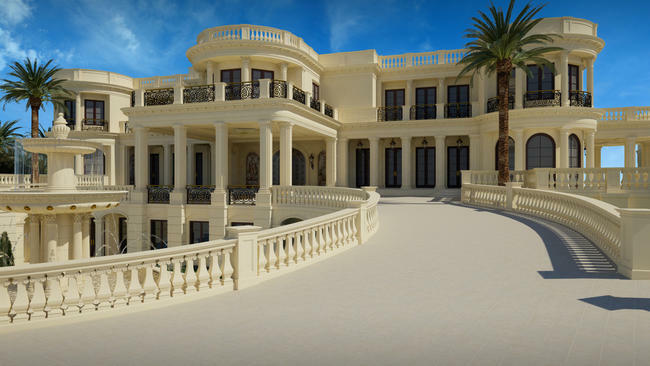 This home is occupied by a Formula One heiress and is selling for a tidy $150 million. In early 2013 a Woodside home was reported to have been sold for $117.5 million, making it, at the time, the most expensive residential property ever sold in the United States. Fortunately you don’t have to spend anywhere near these figures to find a lovely home in Silicon Valley. One of the most expensive homes currently for sale here is a seven-bedroom, seven-bath estate in Los Altos Hills for $27 million. And as for Le Palais Royal’s $2 million staircase, that kind of money will get you into hundreds of nice homes – many with fancy staircases – all throughout Silicon Valley. If you’re looking for just the right home, with or without a staircase, call me at (650) 947-2942.